Three big trends are converging right in front of us: the growth of the freelance economy, the evolution of marketing, and the rise of distributed teams. And they’re all great news for you as a professional community builder. You’re about to find out why. The first trend is the growth of the freelance economy. Today, 53 million Americans – that’s 34% of the workforce –work freelance. And that number is expected to grow to 40% of the workforce by 2020. The second is the evolution of marketing and customer relationships. More and more businesses are adopting lean practices so they can remain relevant. Gone are the 25-page annual plans, static teams, and formal structures. Businesses are replacing them with a focus on testing myriad channels, bringing in freelancers as-needed, and gathering fast data to inform decisions. Companies are learning that they must scale customer relationships in more and more creative ways, and that often requires a community professional. According to Mondo’s Future of Digital Marketing report, marketing teams of the future (which, in this study, included online communities) will consist of 50/50 freelance and permanent workers. The third and final trend is that of the rise of distributed teams. With companies like Automattic and Buffer showcasing how teams work remotely at scale – and the advent of tools like Slack that make it super easy to communicate and collaborate – more professionals are opting to work from wherever they want. Rising rents in cities are also pushing people to work away from centralized locations. In Silicon Valley, where the median price of a one-bedroom apartment is $4500/month, a full 43% of startup employees are now remote, according to Compass. What does this mean for you? Imagine a world in which you can travel to meet community members, work on several projects at once, and continue to build community from anywhere in the world. 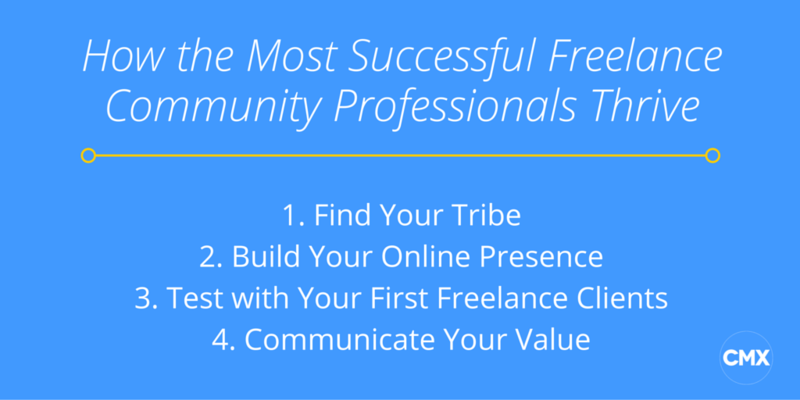 That’s what many freelance community professionals do, and there are a rising number of them among us. It may be time to start dreaming that dream with them. Don’t worry, in this article, my team member Shannon Byrne and I look at the journeys of several freelance community builders and showcase how they’ve built, grown, and sustained their careers. Their advice will guide you in preparing your online profile, securing your first clients, and communicating your value as a freelance community builder. Whether you’re ready to launch or you want to keep this advice in your back pocket for when you’re ready to take a big leap in the future, we’ve got you covered. Having a community of fellow, experienced freelancers is like having a powerhouse mentor. These people are there to share their stories, lessons, tips, and resources, all while providing advice and guidance on your freelance journey. We see this happen in our CloudPeeps Facebook group all the time. Freelancers seek advice from each other on anything from invoicing international clients to pushing back on scope creep. We don’t have to sell you on the value of community, but have you ever imagined how it might elevate you as an independent consultant or freelancer? “When I first went freelance, I was the only one of my friends who wasn’t at a full-time job. I remember my first days wandering around San Francisco, feeling this immense freeing feeling and wondering, ‘Why doesn’t everyone do this?’ Of course, that was totally short-sighted. I ran into all kinds of walls and made mistakes because I didn’t have go-to people to turn to. Your online presence in many ways is the bread and butter of your freelance career. Keep in mind that potential clients not only need to find you, they’ll also likely be hiring you without ever meeting you in person. You need to build trust and credibility through your presence before you even get the chance to speak with them. At CloudPeeps, we specialize in matching businesses with freelancers. We’ve learned a lot about what clients are looking for when hiring. What we found is that, more than anything, they want to know what past clients have said about your work and what it’s like working with you. They want referrals and testimonials. Of course, they want to see past work you’ve produced, but they really want to know the results of that work. Share the specific impact – whether it’s quantitative or qualitative – of each project or role you share with potential clients. And of course, people love numbers. Also, share case studies and testimonials from past clients. Include links to their companies and photos of their faces. Although your potential clients may never speak to them, they’ll feel like they have. After each successful engagement with a client, make sure to ask them for these things and if they will be a reference moving forward. You know it’s important to showcase your work, but how do you make it stand out among the competition? An effective tactic is to write and share valuable, honest and genuine information that’s relevant to your potential clients. Don’t be afraid of giving away IP. Show them what you’ve got by helping them. This could be in the form of blog posts, videos, graphics, podcasts – any form of content that makes you excited! Because he’s the king of building a brand by being his unique self, we asked author, designer and freelance advocate Paul Jarvis to share his tips. If you’re not familiar with Paul, he’s never short of work, has a huge following and creates products to help freelancers be better at their jobs. He accomplished all of this by producing great work, of course, but also by sharing valuable advice for others through his own voice. Ask yourself: are you someone that you’d want to pay attention to? Get to know your audience. Write for their needs and interests; relate to them with your personal stories. Most importantly, don’t be afraid to be yourself; it’s your number one selling point! Social media can be an effective vehicle for making connections and building relationships with potential clients. However, because there’s so much noise out there, you have to be strategic to be heard. In order to captivate your audience, first know where they hang out. Do your research – see where their companies currently have an online presence. Then, target your messaging to pertain to their interests. One of the freelancers in our community, Danielle Maveal does an excellent job of this on her Twitter account. If you take a look at Danielle’s Twitter stream, you’ll see a flow of tweets covering a few specific topics, all engaging, casual and conversational. She doesn’t hesitate to show her personality even when talking about topics pertaining to work. Your bio is another way to stand out on social, especially on Twitter. Use your bio to tell followers what value you’re adding. Try to make it compelling within your 140-character limit, whether that’s through humor, emotion or authenticity. 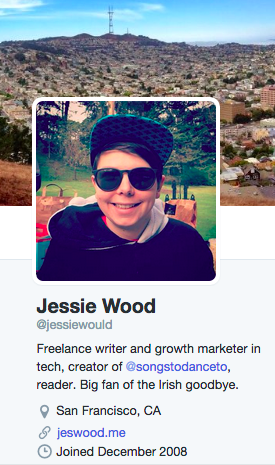 Glancing at Jessie’s Twitter bio, you know that she’s a freelancer, so she’s available to work with, she specializes in writing and growth marketing, she has her own side project (which shows entrepreneurial spirit), and she likes music, sports, and being goofy – a fun person to work with! 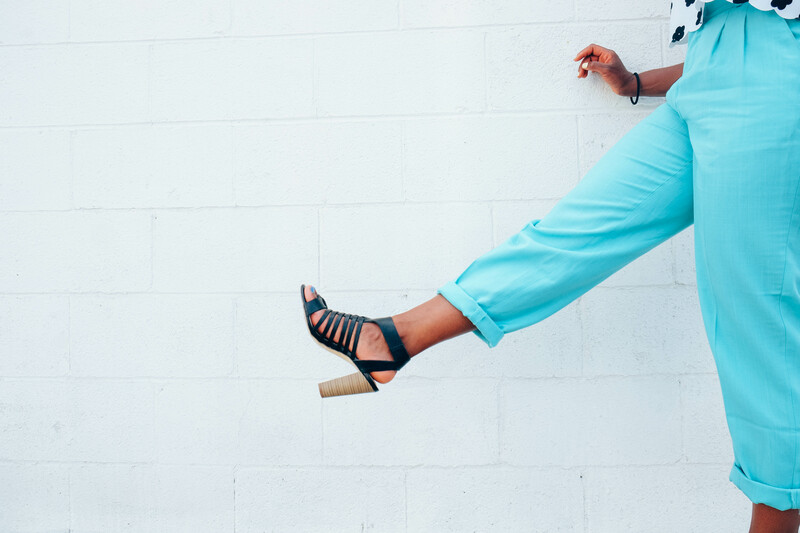 Although you’re probably excited to start building your freelance community career, try testing the waters with a client or two. This will be helpful in a) making sure it’s right for you, and b) learning the ropes of managing your own clients, time, and business. As mentioned, case studies and proof of ROI are crucial to landing new clients. You can take results from your full-time gig, but it helps to have some freelance wins under your belt before making the full transition. Use your first side clients as an opportunity to do that! It also helps to know where to look. There are a ton of sites dedicated to helping freelancers find jobs. Among them are, of course, CloudPeeps, the CMX Job Board and The Muse, as modern takes. But there’s also Upwork, FlexJobs, Freelancer, Guru, the Envato network, and other older players. Facebook Groups can also be a great source of opportunities! Check out CMX, The Freedom to Freelance Project, Dreamers // Doers Jobs, Albert’s Jobs, and the CloudPeeps group for a taste. Another viable option that most people don’t think about is turning your full-time job into a freelance client. We walk through exactly how you can approach this in this article, but the general gist is to present it to your employer as a smarter decision for them. Explain why you’re the best person to do your job, the results you’ve achieved, and how they’ll save money. Alternatively, you can offer your services to consult while they find someone new to bring on, then offer your services to train and onboard that person. Because companies are increasingly hiring freelancers to help build their early communities, it’s all-the-more critical that you take ownership over how you communicate and sell your value as a community professional. If you don’t, your work will hit a standstill and the company will be unsure about keeping you on board. When pitching, do your research about who you’re speaking to and what the company’s goals are. Ask the hiring manager: what is the one goal you’d like to reach to make the community project a success? If they’re data-driven, speak in numbers, stats and ROI. If they’re storytellers, tell them your story in a captivating way. No matter what, touch on their pain points and exactly how you plan to solve their problems. Reference past work, and most importantly, be authentic. You may also need to be ready to sell the business value of community. Start by asking the right questions and figuring out what bottom-line metric community is tied to. Is it for marketing purposes? Support? Growth? Supply-side nurturing of a marketplace? An event series? Get a sense of what metrics they’re currently tracking and where they’re lacking. Does it seem like they’re experiencing an engagement problem? Explain to them how community will increase engagement for their brand specifically. You know the value of community, now it’s your chance to sell it! The very first thing you can do today to start your own venture as a community freelancer is to start talking to people who are already freelancing. Ask them how they launched their careers and what they’re doing to sustain a healthy client pipeline. After that, start looking for your first freelance gig and begin collecting referrals and case studies. When building your online presence, consider creating a portfolio website using a simple site builder like Squarespace or Branded.me. Another option is to create a CloudPeeps profile, as we’ve put a lot of research, thought and effort into designing them to be attractive to clients. Start researching what you need to set up a business structure and create a plan. It doesn’t have to be formal or in-depth, but it will help you clear your mind so you can start down your journey feeling excited rather than overwhelmed. Just remember, you got this. Have fun with it – you’re about to learn so much about yourself and the world around you. There’s now no better time to become a freelancer than now. There are so many supportive communities for you, community professional, that make it easy to take the plunge. We’ll be here to welcome you once you take the leap.